I just downloaded WC 7.02 and unzipped into my previous WConnect7 folder. Then I clicked on the Setup.exe and ran it. 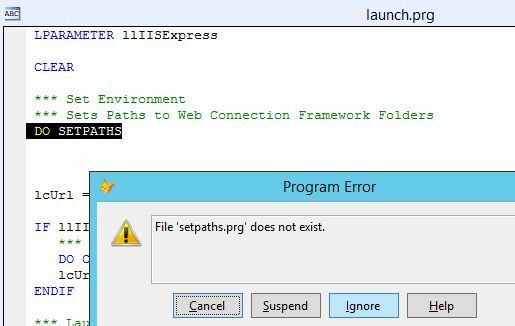 As it was finishing up, Launch.prg was called, but that stopped because it couldn't find SetPaths.prg..
Not sure why that's happening though - the latest templates are not generating that - that looks like the old template. I ask because I've been running each installer before shipping it out into a clean folder, to make sure stuff like that doesn't happen (cause that is a terrible startup experience obviously). Actually I messed up here - I had installed 7.02 on one server, but then I tested the new project on a different server that still have version 7.00. If I create a new test project with the wizard and then I want to remove it completely, is it just a matter of deleting the folder from \WebConnectionProjects, and deleting the new virtual in IIS? Yes just remove the folder hierarchy. If you plan on replacing it you can leave the virtual in place - it'll overwrite settings. If you hang on a little bit I'll push up another update with the latest bits that fix a couple of other things you brought up.